Senator Ahmed Bola Tinubu during a political campaign . The ambition of Senator Oluremi Tinubu, lawmaker representing Lagos Central Senatorial District, to become the Deputy Senate President in the 9th National Assembly may not materialize. 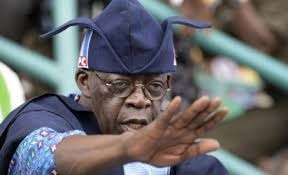 This is because her husband, Bola Tinubu, is opposed to the move. Tinubu is more interested in Lagos State producing the incoming Speaker of the House of Representatives, a position Femi Gbajabiamila, the incumbent Majority Leader of the House of Reps, is seriously eyeing. Tinubu's thinking is that it was impossible for Lagos State to produce both the Deputy Senate President and the Speaker of the House of Representatives in the same dispensation. Speaking on the latest development, an elected member of the House of Representatives, said Tinubu was leaving no stone unturned in ensuring that what happened in June 2015 when the National Assembly elected their leaders did not repeat itself.